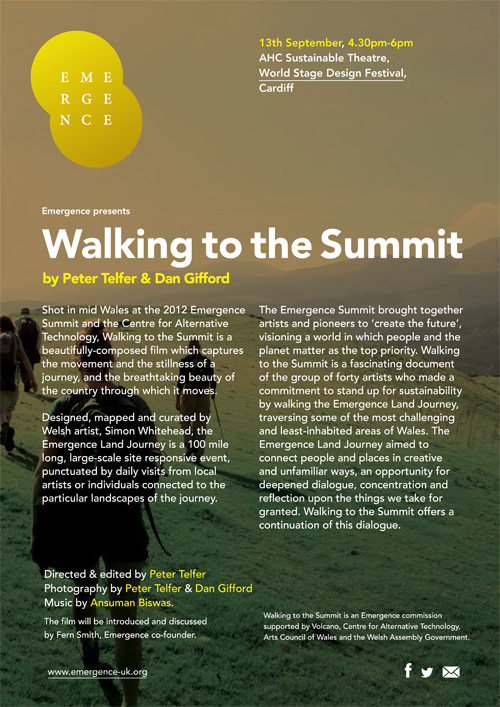 Shot in mid Wales at the 2012 Emergence Summit and the Centre for Alternative Technology, Walking to the Summit is a beautifully-composed film which captures the movement and the stillness of a journey, and the breathtaking beauty of the country through which it moves. Designed, mapped and curated by Welsh artist, Simon Whitehead, the Emergence Land Journey is a 100 mile long, large-scale site responsive event, punctuated by daily visits from local artists or individuals connected to the particular landscapes of the journey. The Emergence Summit brought together artists and pioneers to ‘create the future,’ visioning a world in which people and the planet matter as the top priority. 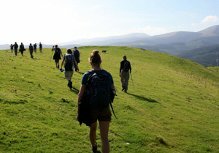 Walking to the Summit is a fascinating document of the group of forty artists who made a commitment to stand up for sustainability by walking the Emergence Land Journey, traversing some of the most challenging and least-inhabited areas of Wales. The Emergence Land Journey aimed to connect people and places in creative and unfamiliar ways, an opportunity for deepened dialogue, concentration and reflection upon the things we take for granted. Walking to the Summit offers a continuation of this dialogue.